The first recordings of gray whale calls and other underwater sounds in Laguna San Ignacio were made by Marylin Dahlheim during the 1980s, and she published descriptions of six major sounds types or “calls” (Dahlheim et. al. 1984). 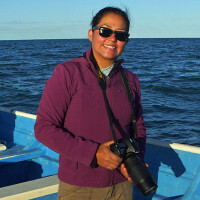 In 1999 Sheyna Wisdom recorded the sounds produced by gray whale females and their calves as part of research for her Master’s Degree at the University of San Diego (Wisdom 2000). 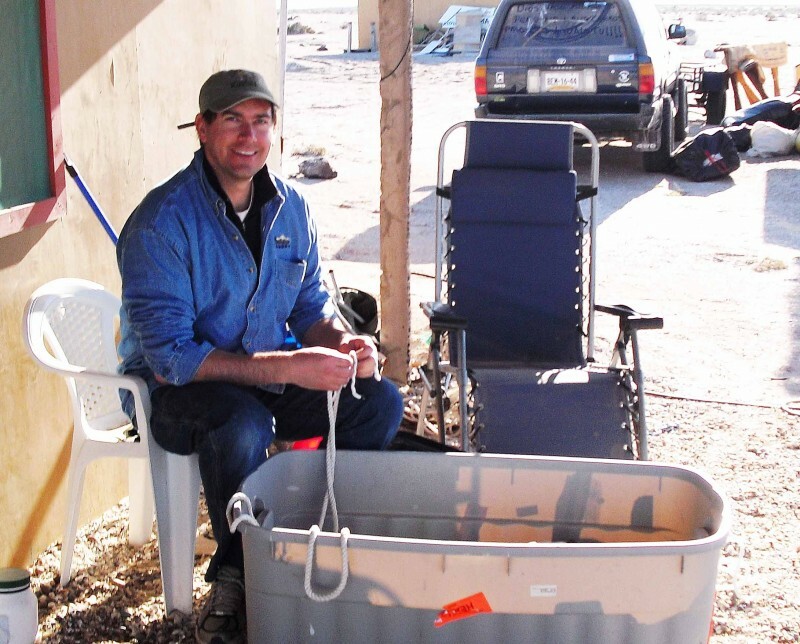 Dr. Aaron Thode of Scripps Institution of Oceanography at the University of California in San Diego, California began investigations of the underwater sounds and noise in Laguna San Ignacio in 2005. Dr. Thode and his graduate researchers are continuing these on going investigations today. 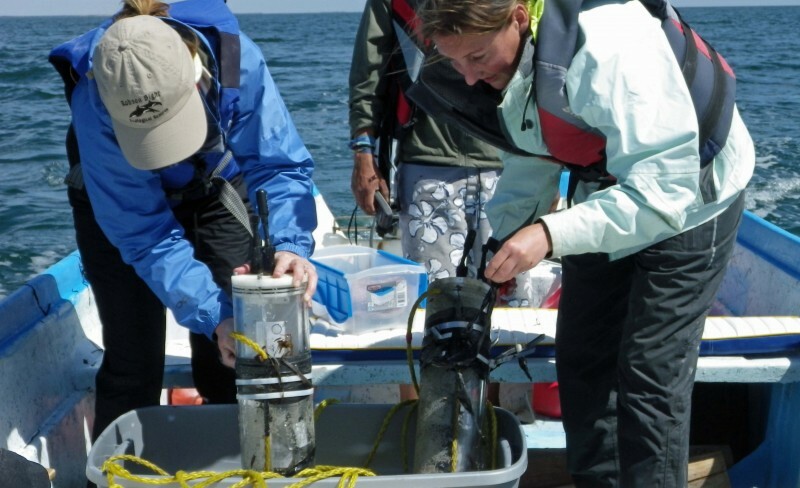 The goal of the acoustics research program is to document the numerous sources of underwater sound in the lagoon, including gray whale sounds, and to monitor those sources of sound over time to identify trends and changes in physical, biological and man-made noise in the lagoon. 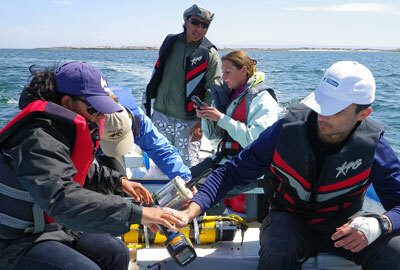 Since the program began in 2005, recordings and descriptions of gray whale sounds from Laguna San Ignacio were published by LSIESP researchers Anaid López Urbán (López et. al. 2011), Diana Ponce-Marado (Ponce et. al. 2012) and Melania Guerrera (2011). Special thanks to Kerri Seger and Ludovic Tenorio Hallé for their help preparing this review of the sounds of Laguna San Ignacio. 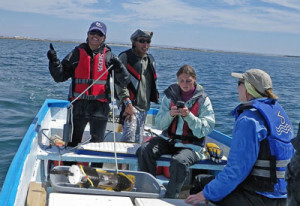 The primary method for monitoring and recording underwater sounds in Laguna San Ignacio is to place digital recording devices on the bottom of the lagoon in specific areas, and to record the underwater sounds for a month or more each winter. 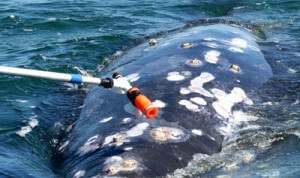 Another method is to use a “hydrophone” or underwater microphone to record sounds from a boat drifting in the lagoon, or attached to a whale with suction-cups. Our acoustic researchers have documented the sounds of wind, rain, and the changing tides in the lagoon. Also the sounds of invertebrates like “snapping shrimp”, fish, and of course the vocalizations of gray whales during the winter. Researchers have also recorded and monitored the presence and numbers of fishing and whale-watching boats that operate in the lagoon. All of these recordings have documented the diversity of sounds in the lagoon and their seasonal trends. In this “Acoustic Gallery” you may select and listen to examples of the sounds recorded in the lagoon, and learn about what the researchers have discovered about their frequency, intensity, and diversity within Laguna San Ignacio during the winter months. There are examples of sounds from gray whales, fish, invertebrates, the wind, rain, and the tides. There are also examples of the sounds produced by whale-watching and fishing boats that operate in the lagoon. 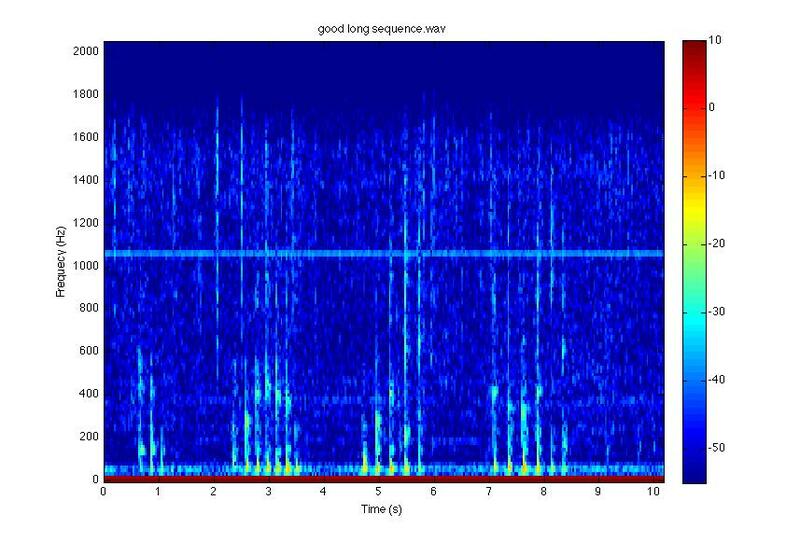 Each example includes a brief description of the recorded sound, a “spectrogram” or picture showing the frequency of the sounds over the time, and an audio recording in MP3 format that you can play to hear the sounds. 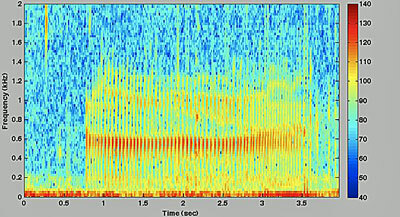 Many of these recording are of low frequency sounds, and they are best heard on a computer sound system that has a wide frequency response including the lower frequencies. You can also use a pair of good quality headphones to accurately hear these recordings on a computer. In this recording the most obvious sound is from snapping shrimp that sound like frying food. The “bongs” and “gurgiling” sounds are made by gray whales, and very low frequency “rumbling” of croaker fish. The wind blowing across the lagoon creates small waves and bubbles on the water surface (chop) and these bubbles produce sounds as they burst. You may also here some distant boat or “panga” noise in this recording. Sound is the primary sensory mode for gray whales and many other animals that live in the ocean. While visibility is often very limited underwater, sound travels about five times faster in water than through the air, and much farther due to the greater density of water. Cetaceans have evolved ways to use underwater sound to navigate when they cannot see, and to communicate with each other often over great distances. While we don’t understand the function and significance of many whale sounds or “Calls,” several different and distinct calls have been recorded in the presence of gray whales in the lagoon during the winter months. These include “Frequency Modulated” and “Pulsive” calls. 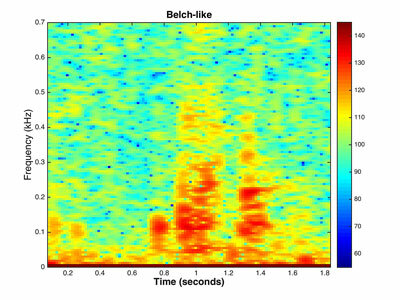 “Pulsive” calls are comprised of individual or a series of “pulses”, or “beats”. Sometimes Frequency Modulated calls can have pulses as they change pitch, and sound similar to Bongo or Conga drums. These include the “Conga” and “Belch-like” calls. 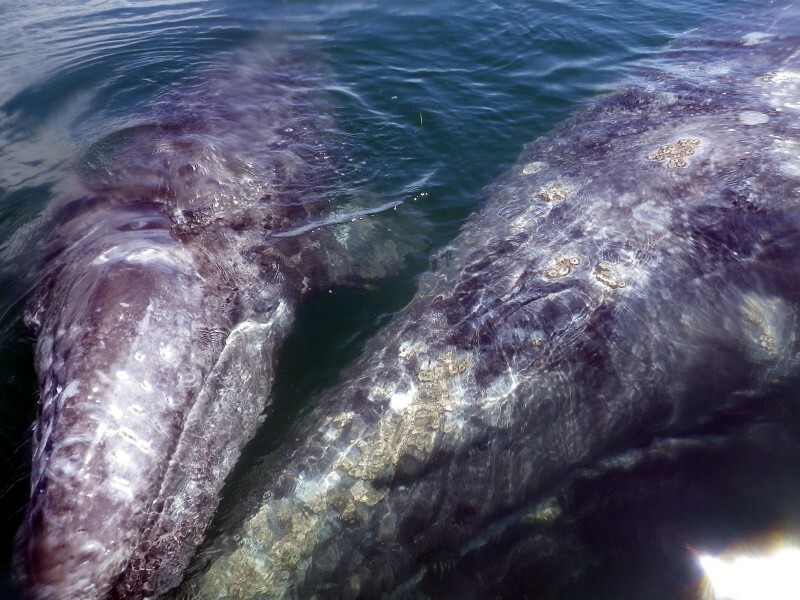 These recordings are of gray whale “Conga” or “S8” calls recorded in Laguna San Ignacio. Congas are one of the most frequently heard sounds produced by gray whales. This recording of a gray whale “Belch-like” calls are pulsed “metallic bongs” and “burps.” These calls are often mixed with “Conga” calls recorded in Laguna San Ignacio. 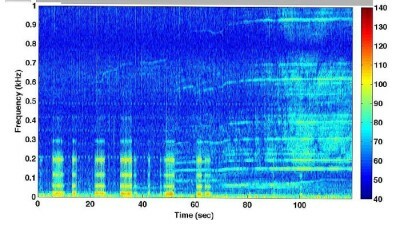 This is a recording of a gray whale S4 or “Croac” call recorded in Laguna San Ignacio. This call reminds us of similar calls made by frogs, and is one of the more interesting vocalizations known to be made by gray whales. This is a recording of a gray whale S5 or “Quejido” call recorded in Laguna San Ignacio. This very low frequency call is one of seven (7) vocalizations known to be made by gray whales. 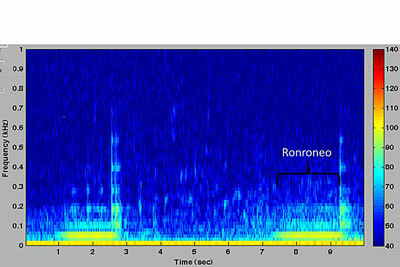 The gray whales’ S9 “Ronroneo” call was first described by LSIESP researcher Anaid Lopez Urban while conducting research for her Masters degree at the National University of Mexico in Mexico City, D.F. (UNAM) in 2010. In this recording we first hear one or more gray whales “Conga” calls, and then the approach of a whale-watching panga (boat) that enters the area where the whales are located. Note that when the panga sounds reach a certain threshold, the whales stop calling. 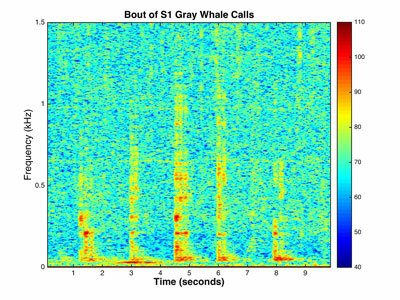 This recording includes a collection of call types recorded from a group of “socializing” gray whales in Laguna San Ignacio. Sheyna Wisdom recorded these calls in 1999 while she was researching gray whale mother-calf vocal behavior for her Master’s degree at the University of San Diego, San Diego, California. . 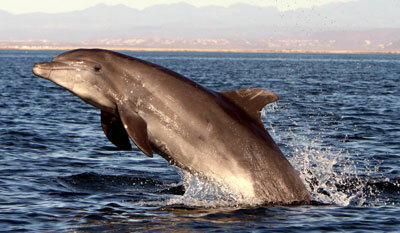 The Bottlenose dolphin (Tursiops truncatus) permanently reside in Laguna San Ignacio [dolphin photo here]. Like many “toothed” cetaceans, Bottlenose dolphin use sound to “echolocate” and navigate through the murky lagoon water when they cannot see. They produce rapid series of broad-band “pulsive” sounds called “click trains” or “buzzing” sounds that rise and fall in their pitch. As these individual “clicks” strike objects, some of the sound energy is reflected back as echos that the dolphin can hear, and they use these echos to identify objects and to navigate through the water. Bottlenose dolphin also produce FM (Frequency Modulated) sounds including “signature whistles” which are believed to be use for communication among these highly social dolphins. 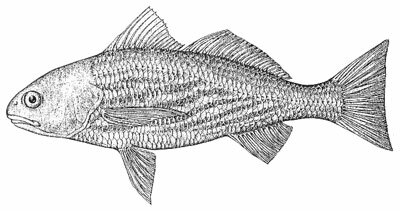 Fish of the family Sciaenidae are called Drums because of the “pulsive” sounds they make with their resonating swim bladders. Corvinas (Cynoscion spp.) are common in Laguna San Ignacio. Corvinas are found in all areas of the lagoon and large schools are often found over soft sandy areas of the bottom, especially in the Lower Zone near the lagoon’s entrance. Sound production by “croakers” increases each evening when these fish vocalize more than any other time of the day. They are a major contributor to the low frequency noise in the lagoon, and they can produce sound for as much as 54 minutes every hour, leaving only 6 minutes of “fish silence” each hour. Snapping shrimp are one of the loudest animals in the ocean. They make pulsive sounds by using their claw to create bubbles. When these bubbles burst (called cavitation), it creates a sound wave that we can hear. Many shrimp creating and bursting these bubbles blend together in what sounds like frying bacon. Snapping shrimp are found throughout Laguna San Ignacio, but they are concentrated in the Upper Lagoon where the water is shallow and furthest from the ocean entrance. 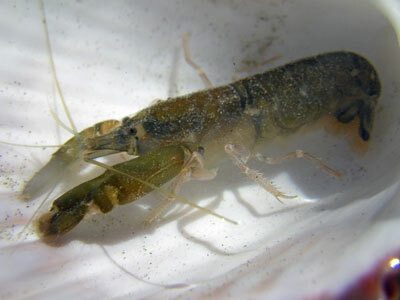 The species of snapping shrimp in the lagoon are: Crangon dentipes and Synalpheus lockingtoni. Snapping shrimp in the lagoon don’t snap the same amount during the entire day. They tend to snap more at dawn and dusk and less in the middle of the day and middle of the night. 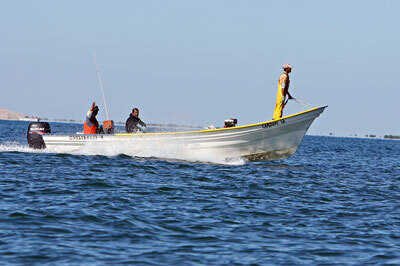 The boats or “pangas” used by local fishermen and the whale-watching operators are powered by outboard engines. As the engine’s propellers move through the water, bubbles are created on the propeller blades. When the bubbles pop (cavitate), they create sound. When the panga is closest to the recording hydrophone, we hear the lowest sound frequencies. When the panga moves away from the hydrophone, the frequencies we hear become higher. 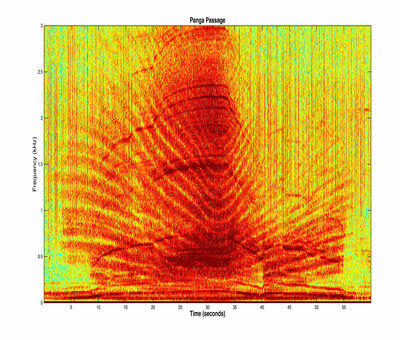 This results in a “spectrogram”, or illustration of sound, that resembles a “smiley face” or “bathtub” shape. The low frequencies produced by pangas are included within the range of frequencies that gray whales can hear. Most often, the gray whales’ response to an approaching panga is to stop producing their calls until the panga has passed. This sound of a 2-cycle outboard boat engine was recorded in the 1980’s in Laguna San Ignacio. These engines ran on a mixture of gasoline and oil, and they were very noisy and produced a lot of smoke and pollution. In the 1990’s all 2-cycle engines were replaced by 4-cycle outboard engines, which are quieter, and do not produce smoke and pollution. As the panga approaches and then passes the acoustic recorder, we hear the frequency of the sounds shift from higher frequencies to lower frequencies, and then shift back to higher frequencies. 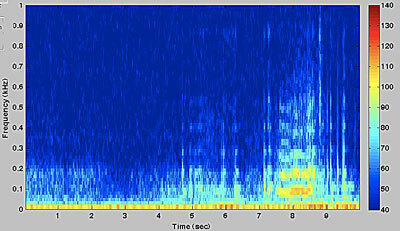 This change in frequency is known as the “Lloyd’s Mirror Effect.” The sonogram of this sound clearly shows the amount of change in the frequencies captured by the recording device. In this recording we first hear gray whales making “Conga” and “Burp-like” calls. 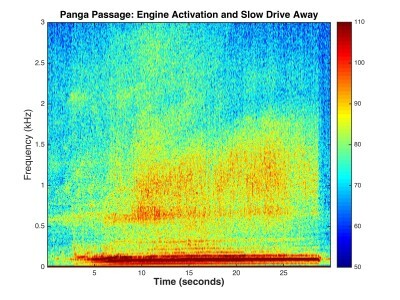 As the panga approaches, the whales call more frequently, and then stop calling as the panga sound increases. 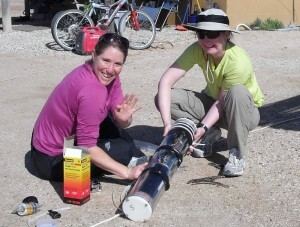 Below are some publications on the findings of acoustic research in Laguna San Ignacio. To learn more about the acoustics program at Laguna San Ignacio, please visit our “Acoustics Program” blogs in the “Research” section on this website. Marilyn E. Dahlheim, Dean H. Fisher, and James D. Shempp. 1984. 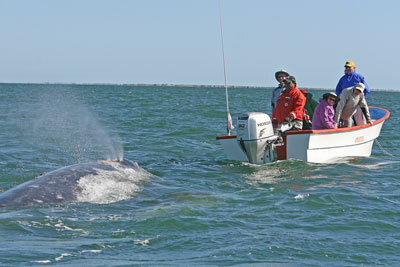 Sound production by the gray whale and ambient noise levels in Laguna San Ignacio, Baja California Sur, Mexico. Pp. 511-541. In: Jones, M.L., Swartz, S.L., and Leatherwood,S., editors. The Gray Whale, Eschrichtius robustus, Academic Press, Orlando. Sheyna Wisdom. 2000. 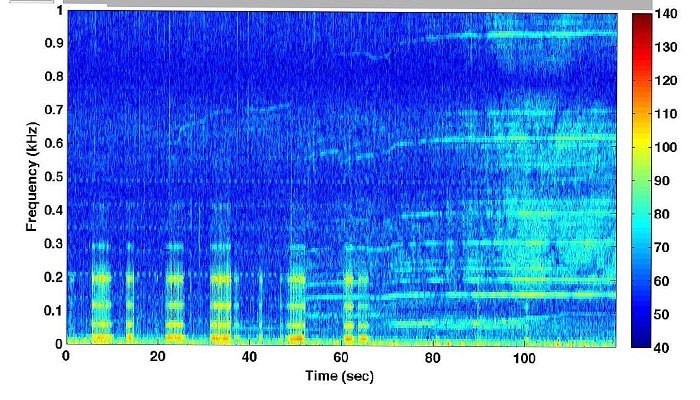 Development of Sound Production in the Gray Whale (Eschrichtius robustus). Master of Science Thesis, University of San Diego, San Diego, California. 260 pp. Anaid Lopez-Urbán, Aaron Thode, Carmen Bazúa-Durán, Melania Guerrera, and Jorge Urbán-Ramírez. 2011. 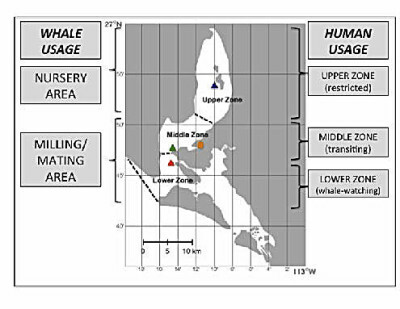 Structure of gray whale calls of San Ignacio lagoon and their distribution in the water column. J. Acoust. Soc. Am. 130,2357; http://dx.doi.org/10.1121/1.3654446. Diana Ponce, Aaron Thode, and Melania Guerrera. 2012. Relationship between visual counts and call detections rates of gray whales (Eschrichtius robustus) in Laguna San Ignacio, Mexico. J. Acoust. Soc. Am. 131(4), 2700-2713; http://dx.doi.org/10.1121/1.3689851. Kerri D. Seger, Aaron M. Thode, Steven L. Swartz, and Jorge Urban R. 2015. The ambient acoustic environment in Laguna San Ignacio, Baja California Sur, Mexico. J. Acoust. Soc. Am. 45 pp.